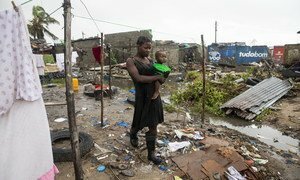 On 24 March 2019 in Mozambique, a boy stands near a destroyed house in an area that was flooded after Cyclone Idai made landfall in Beira. Water levels in #Mozambique started to decrease, which will facilitate and accelerate the humanitarian response from now on. But some areas are still flooded.